ESlog: Free Web based Bore Logging Software. Simple, fast and intuitive web based software. No Licence, No Installation, No cost, No Credit Card. Data can be manually entered as well as exported from ESdat. Start Immediately. ESlog presentation software is simple, fast and intuitive web based software for the reporting of boring and well log data. No setup or installation is required. ESlog is easy to use from your favourite web browser with the ability to create logs and see edits as you make them. Create Borelogs Without The Headaches for Free! Go to eslog.esdat.net on your browser and start creating borelogs today. MORE EMDS SOLUTIONS: explore the website to learn more about our range of scalable products to meet your needs. What is ESlog bore logging software? ESlog is browser based; No setup or install is required. Do I need a licence for ESlog? What version of ESdat Desktop do I need to export to ESlog borehole logging software? You will need ESdat Desktop version 5.1.32 or higher. How do I set up a new log layout? The layout of each log is controlled in files with a "ESlog" extension. Some examples are included in the "Templates" subdirectory of where ESdat is installed. Can I create a new layout? The logo is a file called "ESlog_logo.png" in your Templates directory. It is applied to all logos for your logs. Alternatively a logo specific to a layout can be used by giving the png file the same name as the layout (ie eslog) file. How do I set up graphics for each lithology or backfill? 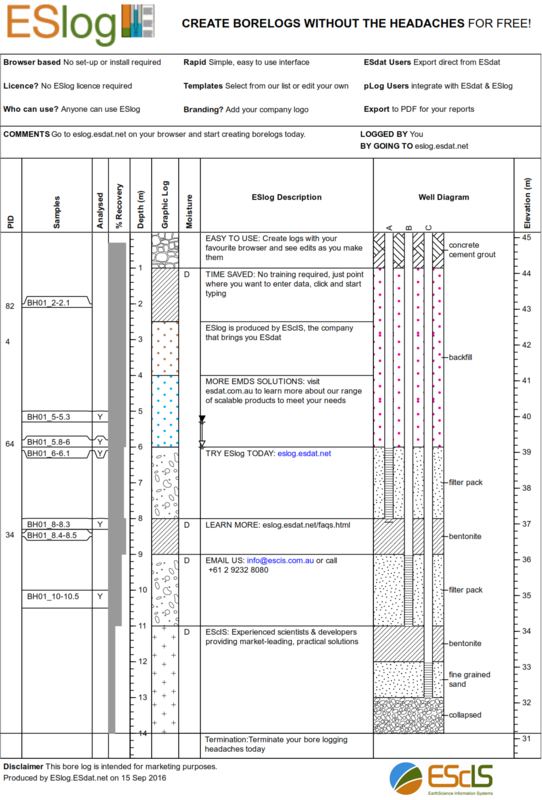 The Graphic Code used for exporting Lithology or Backfill symbols is specified in the ESdat "zRef_Geology_Lithological_Codes" and "zRef_Backfill_Codes" tables, in the "ESlog_Graphic" column. The available Graphic Codes can be obtained by clicking on a graphic in ESlog, to bring up the "Select Graphic Pattern" selector. How can I modify the data that is exported from ESdat to ESlog. If opened the "ESlog" layout file in a text editor it has placeholders called "DataSource" and "HeaderInfo", which reference data exported from ESdat by a GEDT file called "ESdat_Logs.gedta" (Access version of ESdat) or "ESdat_Logs.gedts" (SQL Server version). These GEDT files are included in the the "Templates" subdirectory of where ESdat is installed. Can I use a custom "gedt" file for just one log. The standard "gedt" file that is shipped with ESdat should cover most data export requirements, however it can be edited (copy out of the install directory to your Templates directory) or a custom one can be used for each log. A custom one will have the same name as the matching "ESlog" file, but with a "gedts" or "gedta" extension. Do I have to include waterstrike in the Material Description Column? No, water strikes can be included in any text or graphic column, either combined with other data or by itself. How do I set up a new log with my own data? Can I change the Logo and the Headings? Yes, simply click on the Logo or the Heading to be changed and enter new values. Can I use a different layout, for example change the data columns? You can make any changes you like by clicking on a column and editing the "Layout" tab. No support is available to assist, unless you wish to engage EScIS to provide a layout for you. You can click Data - Save and save the data to your own systems, and re-upload it using Data - Open. Online saving of the data is unlikely to be available for the free version.